2. 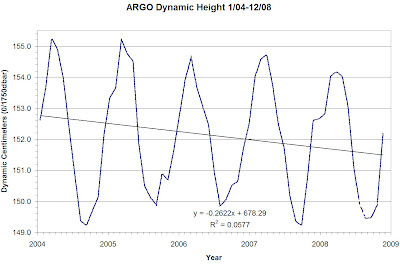 I have used dynamic height from 1750 dbar depth relative to the surface (0 dbar), as used in this paper which compares ARGO dynamic height to satellite altimetry sea surface height measurements. 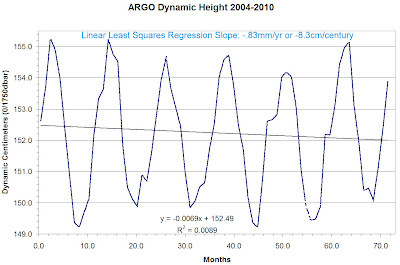 Note: ARGO dynamic height (DH) and Satellite Altimetric Sea Surface Height (SSH) are measurements related to "sea levels" but can have divergences. 3. The linear least squares regression equation is included and shows more of a downtrend in dynamic height (-.83mm/yr or -8.3cm/century) vs. the 0/100 dbar graph in the original post. 4. The R² of the linear regression is incorporated in the graph and is indeed low, as one would expect when trying to detect a tiny linear trend in data containing huge & chaotic seasonal and ocean oscillation components. I presume the confidence limits may be tightened by massaging out the semi-sinusoidal seasonal component by fitting a sinusoidal least-squares regression to the data, removing that component, and then doing a linear least squares fit. If anyone is so inclined to do this or would like to do your own statistical analysis, here is the spreadsheet of the digitized graph values. "On global scales, Argo and Jason, together with satellite gravity measurements, partition global sea level rise into its steric and mass-related components (Willis et al, 2008, Cazenave et al, 2009, Leuliette and Miller, 2009, Wunsch et al, 2007)." Adding the two together yields a Total Sea Level decrease of -.53mm/yr or -5.3cm/century. Thanks for providing the data without an FOIA request! This might sound like I've changed my position from before, but I had a bit more of a think about what this measurement represents (as you can tell I'm just an interested lay physicist). Essentially, this plot is measuring the density change of the top (approx) 1750 metres of the ocean (as 1750 dbar is at approx 1750m depth). This change is almost totally related to steric changes (thermal expansion) and will not be affected by addition of water from melted land ice (which would raise the 0 dbar and 1750 dbar level by roughly the same amount). Addition of fresh water from melted ice is estimated to be 2mm per year, which is obviously a very small proportion of the volume of ocean being analysed (0.002 metres/1750 metres) so I would guess has minimal impact on salinity, and therefore density. The paper that was used to validate the comparison between this measurement and salinity used data over only about 1 year. This then validates the comparison over the seasonal cycle which is driven by steric changes, but does not necessarily say anything about the long term trend. So this measurement seems to be roughly in line with other measurements that point to most of the recent (6 years) sea level rise not being steric, but being due to land ice melt. The level seems to have gone up in the last year which seems in line with a recent uptick in the satellite altimetry. Steve, what do you think about the update above? It's great news that there's been a 0.53mm decrease per annum from 2004 to 2009. That will obviously more than make up the 1.88mm increase per annum from 1900 to 2003. Lev: suggest you take a took at the post just before this one that explains the faulty tide gauge data which makes up much of the period you mention. Much is an artifact of subsiding, tectonic shifts, measurement errors, etc. But even if it has risen, the point is oceans have been rising and falling to much more radical extremes since the beginning of time due to natural processes and there is no evidence to suggest that this current cycle has anything to do with man or that there is anything man could possibly do to change these uncontrollable natural processes. For more explanation watch one of Professor of Geology Ian Plimer's videos on this site or the net which explains it well. If CO2 continues its steady rise, why is the sea level stabilizing and the globe cooling? Natural processes. "If CO2 continues its steady rise, why is the sea level stabilizing and the globe cooling?" Because contemporary sea levels and surface mean temperatures, as you mention, are the result of a range of factors many of which whose effect is measured well after their input (e.g., CO2 emissions). Some contributions to contemporary sea levels are natural, most are anthropogenic. A slight dip in sea levels from 2004 to 2009 is nothing compared to the rise from 1870 to 2004. It'll take more than 350 years at the current rate of deline, assuming that it is maintained and they are universal, to return the levels around the start of the 19th century. A similar story applies to surface mean temperatures. Once the embarassing cherry-picking (1998 was a particularly, and unusually, hot year) is removed the general trend is very clear. I am aware of Professor Pilmer's very unorthodox views on weather and volcanic activity. 1. why would there be a "delayed" greenhouse effect? Reference please. The greenhouse absorption/emission of infrared is instantaneous. Secondary absorption and thermal expansion of the oceans is instantaneous. 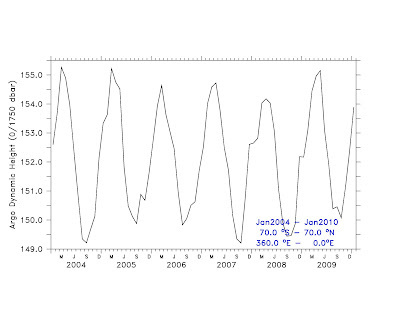 While you're at it, please explain why CO2 levels LAG temperature by 800 years in ice core data. 2. Reference please. totally unsupported & contradicted by overwhelming evidence. Why have sea levels been hundreds of feet higher in geologic record without any anthropogenic influence? and why have they cycled back & forth much lower & higher than today without anthropogenic influence? Why have sea levels risen 2 meters over 1 century at a time when CO2 levels were lower. All my references are on this site in case you are interested. 3. once again read the Morner interview explaining natural cycles and gross errors in sea level tide gauge AND satellite data since the tide gauges were used in calibrating the satellite. And even if the change you think is correct, please explain how it is different this time vs. countless other times since the beginning of time. 4. I'm well aware 1998 was a record El Nino. Nonetheless we are way way off "schedule" from the IPCC model projections... hmmm maybe they don't take ocean oscillations into account in their fancy models (they don't) even though the oceans hold 98% of the earth's heat, not to mention an absurd number of other shortcomings. 5. Reference please on Plimer's "unorthodox" views. I think what's interesting is that there has clearly been very little energy going into the ocean during the Argo era, and that the observed sea level rise in this period is all down to land ice melt. I don't think the stats are good enough to say that the steric sea level is falling with any worthwhile degree of significance both due to the high seasonal variability and the short term nature of the record. The question is whether this data validates other records. It seems to validate the OHC analyses of Willis etc. And combined with the Grace data, it seems to validate the satellite record that has shown similar smaller level of sea level rise over the ARGO period, but *has* shown larger sea level rises prior to this period. The Nils Axel-Mörner quotes always seem to be quite old, and I've never seen a scientific analysis of his claims, eg, that the changes in the rotation speed of the earth invalidate the sea level rise claims. Steve: do you know anything about Axel-Morner's claim about the satellite adjustments to tide gauges? I meant adjustments up (or down) to the satellite data based upon tide gauges? Nils Axel-Mörner is in retirement. INQUA has distanced itself from his views. His statements about sea level were refuted in Nerem et al (2007). I am not aware of Dynamic Height being the same as Steric Sea Level. Dynamic Height measures pressure (more or less), Steric Sea Level measures salinity and temperature. I do not know what you get when you add Dynamic Height to Water Thickness of a land mask, since I do not have that much experience. I just wonder why you don't use a calculation of other people. They say: Sea Level is rising, not as much as formerly predicted (e.g. in IPCC 4AR). Rising by 2.5+/-0.4 mm/yr, which is really not THAT much, I mean, 25 cm in a century, nothing to get overly excited about, isn't it? A skeptic could use this argument without a problem. Doesn't applying a land mask to GRACE data accomplishes a measurement of land data? Furthermore concerning the Ocean Mass, I would take a look at Lombard et. al. (2007), which goes into detail about analyzing GRACE data. And it really is heavy duty stuff. 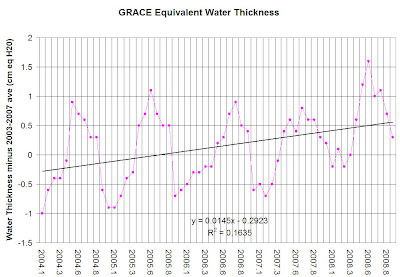 Fortunately the GRACE data is quite easy to use - they have already done all the heavy lifting and offer only one downloadable product: "equivalent water thickness" which is exactly what we want. Have a look at the site. I am looking at what other people are saying of course and wonder why I'm getting a different result. Wonder if some "adjustments" have been done, how, & why. Just curious. 1. I did not write there would be a delayed greenhouse effect. I wrote that there can be a delayed effect in sea level and temperature changes. I assume you understand the difference. 2 and 3. I have already provided the CSIRO data on sea-level changes (Church and White, Geophys. Res. Lett., 33) which I find acceptable and correlates with other findings (e.g., Douglas, Surveys in Geophysics 18: 279–292, 1997). Of course, sea levels have naturally varied over time. How one then decides that current changes are entirely natural is a matter of some speculation. 4. The latest data (cf., http://www.ccrc.unsw.edu.au/Copenhagen/Copenhagen_Diagnosis_HIGH.pdf) actually suggests that the IPCC is largely accurate. Use of 1998 as a data point is just so selective it makes any claim to objectivity quite risible. 5. Plimer has argued that El Niño is caused by earthquakes and volcanic activity at the mid-ocean ridges, in contrast with the orthodox view that it is from interactions between the atmosphere and ocean (http://www.pmel.noaa.gov/tao/elnino/el-nino-story.html). He has also argued that Pacific Island nations are not seeing changes in sea level due to global warming but - and I quote - "vibration consolidating the coral island sands". In other words, the sea isn't rising, rather the islands are sinking. It's a cute theory, but pretty out there. Anyway, I've finished here. Judging by the rest of your site, I don't think that you'll change your opionion on this matter regardless of the data presented. Lev: we were just getting started, don't leave now! Sorry if my prior comments were too harsh - I mistakenly thought you were one of those people that just says things without any scientific basis - and I was wrong seeing the references you have provided. It's a lot to look over and I will do so before saying anything about it. I honestly am a seeker of the truth and that is why I am assembling all of this information firstly just as a place to put all of it as I seek the truth in these diverse fields I'll be the first to admit I knew practically nothing about, and secondly to open it up to a scientific debate so others can set me straight if I'm wrong. I'm not selling any t-shirts, advocating any political views, don't have a tip jar, am not interested in anyone else's money, don't receive any compensation for this, and have opened all the threads for comments- if you think anything on this site is scientifically wrong please point it out. Heck I've already corrected multiple mistakes of mine on this thread alone thanks to readers pointing them out. You will note that I only started this blog After Climategate because I thought everything we were being told was true, but clearly the emails changed that. If you are still there and while I'm looking over your references, could you answer me this: why do you think "Some contributions to contemporary sea levels are natural, most are anthropogenic." About oceanographic modeling, you might try Modern Approaches to Data Assimilation in Ocean Modeling to get a first insight about the complexities and traps of data handling. I've just been checking google Scholar for Mörner's work, and found the paper that the Nerem link above comments on. The problem is he claims the satellite record shows no sea level rise. But he cites nobody elses work, including failing to cite the key people working in the field who have produced analyses that show sea level rises. I note he had a comment on how earth rotation rate changes would limit sea level rises to below 1mm per year from 1850-1930, but the IPCC data have come up with a rise of about half of this over a similar period (Figure 5.13 AR4 WG1). So I don't see where the difference is. "The problem is he claims the satellite record shows no sea level rise. But he cites nobody elses work"
You bring up a point I have often pondered. How does an original idea get brought forth if everyone is supposed to cite someone else's work?